Using data from the Kilo Degree Survey, a team of astronomers reveal that dark matter in the cosmic web, which accounts for about one-quarter of the content of the Universe, is less clumpy than we previously believed. Hendrik Hildebrandt from the Argelander-Institut für Astronomie in Bonn, Germany and Massimo Viola from the Leiden Observatory in the Netherlands led a team of astronomers from institutions around the world who processed images from the Kilo Degree Survey (KiDS), which was made with ESO’s VLT Survey Telescope (VST) in Chile. For their analysis, they used images from the survey that covered five patches of the sky covering a total area of around 2200 times the size of the full Moon, and containing around 15 million galaxies. Intriguingly, the results of their analysis appear to be inconsistent with deductions from the results of the European Space Agency’s Planck satellite, the leading space mission probing the fundamental properties of the Universe. In particular, the KiDS team’s measurement of how clumpy matter is throughout the Universe — a key cosmological parameter — is significantly lower than the value derived from the Planck data. This video shows the location of one of the five KiDS regions that were surveyed by the VLT Survey Telescope at ESO’s Paranal Observatory in Chile. This region (known as G12) covers a large area of sky along the celestial equator in the constellations of Leo (The Lion) and Virgo (The Virgin). 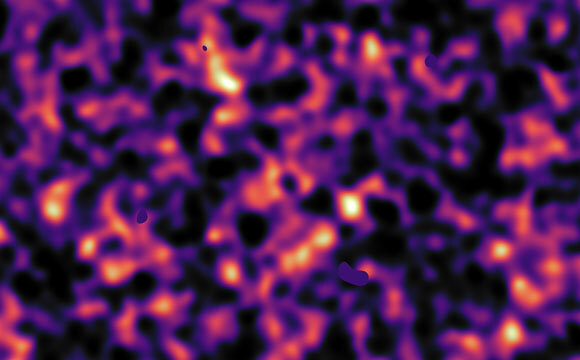 The final colour dark matter density image reveals an expansive web of dense (light) and empty (dark) regions. This image reconstruction was made by analysing the light collected from over three million distant galaxies more than 6 billion light-years away. 1 Comment on "New Study Shows Dark Matter May Be Smoother Than Expected"
We ‘detect’ the superfluid dark matter every time a double slit experiment is performed, it’s what waves. Superfluid dark matter fills ’empty’ space, strongly interacts with and is displaced by baryonic matter. The Milky Way’s halo is not a clump of dark matter traveling along with the Milky Way. The Milky Way’s halo is lopsided due to the baryonic matter in the Milky Way moving through and displacing the superfluid dark matter, analogous to a submarine moving through and displacing the water. Superfluid dark matter displaced by baryonic matter relates general relativity and quantum mechanics.